Mark S. Mulholland | Ruskin Moscou Faltischek, P.C. Does constitutional substantive due process protection apply to camera enforcement? Mark S. Mulholland has represented businesses, Fortune 50® corporations, municipalities, government agencies, and individual entrepreneurs in all manners of disputes and in all forums. He focuses on traditional courtroom contests, and is accomplished as a litigator and trial attorney in federal and state cases across the country. With broad experience litigating complex business disputes in virtually every field—intellectual property, condemnation, antitrust, securities matters, licensing, unfair competition, copyright, trademark, contract disputes, constitutional challenges, RICO and beyond—he has litigated cases that span from simple to complex. He is a senior member of Ruskin Moscou Faltischek, P.C.’s Litigation Department, one of the largest practice groups on Long Island dedicated exclusively to commercial litigation. Mark was managing partner and member of the Management Committee for the firm from 2005-2014. Following active service as a senior trial attorney and captain in the U.S. Army J.A.G. Corps, Mark has become recognized as one of the foremost civil litigators in private practice in the region. Mark is a contributing author to the widely acclaimed treatise, Commercial Litigation in New York State Courts, West’s New York Practice Series, published by Thompson Reuters (2015 4th Edition). In 2011 he served on the New York State Judicial Salary Commission, the historic commission that reset judicial salaries statewide for all 1,300+ judges serving in New York State. A copy of his opinion endorsing fair and reasonable salary increases for the New York judiciary is viewable here. After graduating with honors from the University of Notre Dame in 1982, he earned top honors and received multiple individual citations at the State University of New York School of Law. He served as articles editor of the University Law Review, was a champion member of the moot court team, won first place at the elite J. Braxton Craven National Moot Court Competition in Chapel Hill, North Carolina, won the coveted Robert J. Connelly Trial Practice Award, and earned the Albert Moot Evidence Prize. Mark began his legal career as a Captain in the U.S. Army Judge Advocate Generals’ Corps where he represented soldiers at military courts martial. While in the service, he trained with the famed 1st Airborne Battalion, 507th Infantry Regiment and earned the prized “Silver Wings” of the U.S. Army Airborne Corps. He went on to become the senior defense counsel at the National Training Center at Ft. Irwin, California where he was personally responsible for representing soldiers at General Courts Martial, including major espionage and federal felony cases. While in government service, he also served as special assistant to the U.S. Attorney for the Central District of California. 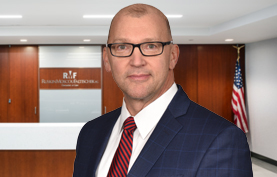 He began his civilian career in commercial litigation at Willkie Farr & Gallagher in New York City before joining Ruskin Moscou Faltischek, P.C. in 1991, where he quickly attained partner status. He was selected as court appointed counsel to receiver by Manhattan Commercial Div. in Napoli v. Bern. Mark was elected as a board member of Brookhaven Memorial Hospital Medical Center in 2008 and was appointed to the New York State Judicial Salary Commission in 2011. He has served as a trustee and vice president of the Board of Education in his home village in the Town of Babylon, was selected to serve as a board member of the Long Island Aquarium, and was appointed a public member of the New York Mercantile Exchange Adjudication Committee. He is a member of the New York State Bar Association, the Nassau County Bar Association and Suffolk County Bar Association. He lectures and writes often on litigation topics, is a contributor to the New York Law Journal and serves as a mediator in the Eastern District of New York’s Federal Court Mediation Program. “Commercial Leasing,” with Hon. Orin R. Kitzes et al., Chapter in, Commercial Litigation in New York State Courts, West’s New York Practice Series, published by Thompson Reuters, 2015 Fourth Edition. “Condemnation Landscape Following the Supreme Court’s Kelo decision,” Nassau Lawyer, January 2006. “High Court Resolves Commerce Clause, 21st Amendment Clash,” New York Law Journal, Outside Counsel, June 6, 2005. “Web-Wine Case: Commerce Clause, 21st Amendment Clash,” New York Law Journal, February 2005. “Specificity Is Critical in Motion to Dismiss Multicount Complaint,” New York Law Journal, January 2005. “Federal Rule 68: A Rarely Used Defensive Tool,” New York Law Journal, February 2004. “Doctrine of Foreign Equivalents in Trademarks: Of Growing Importance Resulting from Increase in International Trade,” New York International Law Review, Winter 2000. “Avoiding Website Liability,” Netcommerce Magazine, March 1999. “Why Lenders Must Be Cautious When Taking Trademarks as Collateral,” New York Law Journal, June 3, 1999. “Seller Beware: Out-of-State E-Commerce Suits on Rise,” Long Island Association Helpline, Winter 1999. “ICANN Announces Commencement of Competitive Domain Name Registration Process,” Netcommerce Magazine, May 1999. “Island Employers Take Action: Institution of Workplace Policies to Minimize Catastrophic Loss Is Now Routine on Long Island,” Long Island Business News, October 2, 1995. Winning $8.5 million trial verdict achieved in eminent domain trial against City of Long Beach arising from condemnation of prized ocean-front Super Block land from law firm real estate clients, including successful defense of appeal before New York Appellate Division—SUN LF/Silverberg & Bombart v. City of Long Beach (Nassau County Sup. Ct. and Second Dept.) (Lead counsel on trial and appeal). Successful dismissal of $1 million + insurance carrier excess reimbursement claims against regional physicians under New York Insurance Law—United Healthcare v. Paracha et al. (Suffolk County Sup. Ct.) (Lead counsel). Winning jury verdict achieved, dismissing all claims and awarding attorney’s fees to defense in civil rights action against Long Island municipality—Ehrlich v. Village of Sea Cliff (E.D.N.Y.) (Lead counsel). Successful dismissal of shareholder derivative claims and R.I.C.O. claims alleged against New York City Cooperative Board, on behalf of real estate developer. Goldstein v. Bass et al. (Queens County Sup. Ct.) (Lead counsel). Winning jury verdict dismissing all claims and awarding approximately $1 million damage award on counterclaims following two-week federal trial between pharmaceutical competitors—Pedinol v. Rising Pharmaceutical, Inc. (E.D.N.Y.) (Lead counsel). Successful dismissal of Class Action Section 1983 Civil Rights Equal Protection Claims and Due Process Claims filed against county government arising from automated Red Light Camera Program—Leder v. ATS and County of Nassau (E.D.N.Y.) (Lead counsel). Successful defense of threatened condemnation action against Deepdale Golf Club through coordinated state and federal actions challenging planned takeover—Deepdale Golf Club v. North Hills (Nassau County Sup. Ct. & E.D.N.Y.) (Lead counsel). Prosecution and successful settlement of $250 million suit against financier of 2,000 acre Virginia condominium project (Magnolia Green, et al. v. iStar Financial, Inc. (New York County Sup. Ct.) (Lead counsel). Successful condemnation of shopping center on behalf of Long Island school district—In the matter of Village of West Hempstead (Nassau County Sup. Ct.) (Lead counsel). Successful dismissal of $250 million contract claims on behalf of clients General Motors and EDS in Computer Associates v. General Motors (Nassau County Sup. Ct.) (Co-counsel). Successful trial and settlement of polypropylene supply contract claims against General Electric Company subsidiary—Petroco America, Inc. v. Polymerland Division of General Electric Company (E.D.N.Y.) (Co-counsel). Successful prosecution of misappropriation claims against Ringling Bros. And Barnum & Bailey Circus/Feld Entertainment—High Point v. Feld (S.D.N.Y.) (Lead counsel). Successful prosecution and settlement of unethical practices claims against Nassau County private attorney—Levitt v. Handler (Nassau County Sup. Ct.)(Co-counsel). Successful defense of patent infringement claims against Newell Rubbermaid & Grayco Children’s Products—Nat’l Molding v. Newell (E.D.N.Y.) (Co-counsel). Recovery of permanent injunction on behalf of land owner in Shelter Island, New York—Hoffman v. Shelter Island Heights P.O.C. (Suffolk County Sup. Ct.). Dismissal of trade secret misappropriation and injunction claims against urbanfetch.com—Kozmo v. urbanfetch.com (New York Cty. Sup. Ct.) (Lead counsel). Jury verdict won on behalf of plaintiff in trademark misappropriation case involving R.I.C.O. and fraud claims, on behalf of Fortune 50 clothing manufacturer Kellwood Company—Kellwood Company v. Yagoda (New York Cty. Sup. Ct.) (Lead counsel). Successful and defense and dismissal of claims against Armstrong Worldwide Industries subsidiary Thomasville Furniture—Nanrich Furniture Corp. v. Thomasville Furniture (E.D.N.Y.) (Co-counsel). Dismissal of declaratory judgment claims and successful settlement of landmark Long Island dispute involving renowned DUCK mark—Duck Walk Vineyards v. Duckhorn Vineyards (E.D.N.Y.) (Lead counsel).